Eileen West Sleepwear - A time honored commitment to stylish comfort and luxury makes Eileen West one of the world’s most famous (and favorite) sleepwear brands. Inspired by the organic beauty of the San Francisco Bay coastline, Eileen West nightgowns, pajamas, and robes are sought after for their light and airy styles. Eileen West sleepwear also features other brands, each with its own uniquely feminine appeal. From the delicately detailed Queen Anne’s Lace to the Austrian influenced Lanz of Salzburg, it’s easy to see why this womens sleepwear label is so incredibly popular. Well-known and beloved for its timeless simplicity and classic femininity, Eileen West offers an amazing range of ladies sleepwear favorites that are hard to resist. With a fresh and whimsical feel, popular long, midi, and short nightgowns are available in soft and flowing fabrics such as cotton, modal, knits, and jersey blends that are incredibly creamy to the touch with an effortless and relaxed fit. Eileen West is also recognized for its incredible attention to details – from delicate front plackets with tiny pearl buttons and scalloped lace necklines to invisible side pockets and perfectly placed rusching, it’s easy to understand the appeal of this attractive sleepwear brand. Originally created as a couture line to complement its popular sister brand, Eileen West sleepwear, the Queen Anne’s Lace collection is famed for its delicate femininity and high end retro look. With intricate details that include elaborate pin tucking, beautiful pearlized buttons, extravagant appliqués, heirloom or Venise lace trims, these romantic cotton nightgowns have a timeless elegance that’s reminiscent of luxurious gowns from the Victorian era. 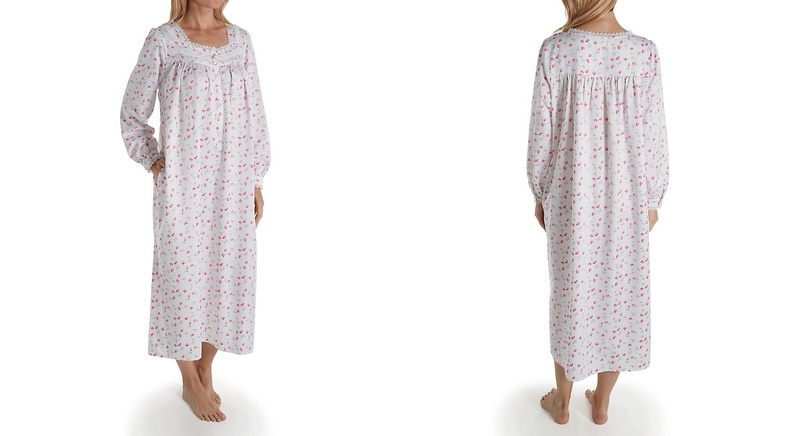 Available in a comprehensive range of sizes, including xsmall through to 2x, Queen Anne’s nightwear is designed for maximum comfort with an easy and generous fit that is just as flattering on smaller silhouettes as it is on women with curves. Keeping true to the limited color choices of the Victorian era, these nightgowns are offered in fresh and crisp winter white, sky blue, and pale pink. From their famous red tartan flannel nightgowns to cozy Tyrolean print pajamas and beautiful floral print robes, this iconic flannel sleepwear brand makes it easy to imagine yourself snuggled up on the sofa with a cup of hot cocoa, enjoying Hollywood classics like the Sound of Music. Hollywood blockbusters, yodelling, and lederhosen aside, when it comes to ladies sleepwear favourites that stand the test of time, Lanz of Salzburg is the quintessential warmwear choice that women of all ages turn to when the temperature drops. With design inspiration from the traditional folk costumes of Salzburg Austria, this womens sleepwear has been keeping women warm since 1922. 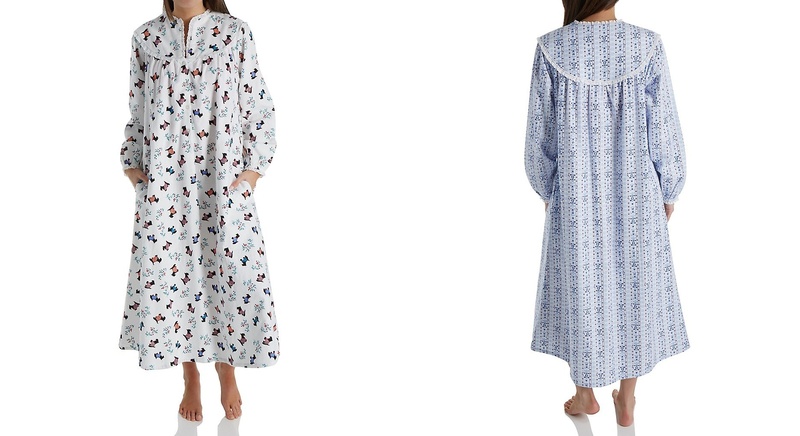 Incorporating historic styling with modern versatility, and attention to detail, Lanz nightgowns offer exciting warm wear nightgowns in an extensive size range. From Xs to 3x, Lanz has you covered.